When I was thinking about how I could jazz up my girls’ trick-or-treat buckets, (I’m always looking for a good reason to use ribbon), when I stumbled across some empty ice cream buckets. It was meant to be! They are sturdy, have great handles, and are the perfect size for all those Halloween treats! 1. Using the hot glue gun, apply the felt to the bucket. Trim where necessary. 2. Add ribbon to the top and bottom of the bucket, covering up the felt edges, and the top rim. 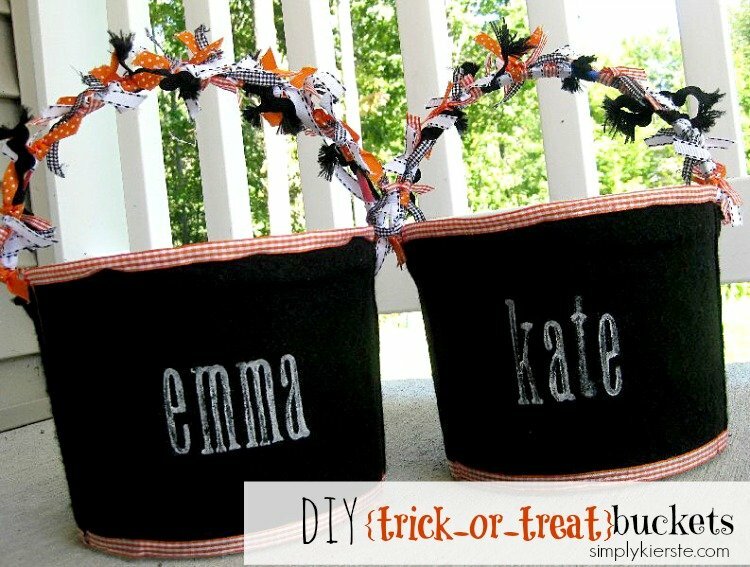 There you have it–the most adorable trick or treat buckets ever! organizing toys, art supplies, etc. UPDATE: My girls have now used these for 4 Halloween nights, and getting ready for the 5th! They hold up very well!!! *See this project featured on www.allfreeholidaycrafts.com–click HERE! HOLY CRAP those are cute! And stamps? Who knew? And I'm totally telling my blog readers to check these out. Oh man, I just threw away an ice cream bucket! I suppose I could recycle an old Easter one?? These are too cute. I'm visiting from Crap I've Made. Thanks for the tutorial! HA, this would work for Easter, too, now that I think of it! Too cute. So cute! I will be linking your tutorial to my blog tomorrow! Love your blog! I'm putting this blog in my reader so I know when you post. DARLING!! I will so be featuring these soon! Another use for ice cream buckets to store frozen blueberries and raspberries in…this way you can just scoop out what you need!!! Love the buckets!!! totally cute… these are the gallon sized plastic buckets, right? Alissa, yes, although one of them is a little bigger than that. They both used about the same amount of materials though. 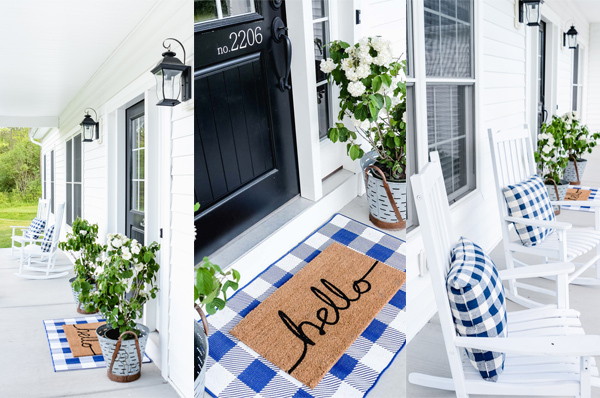 Just found your blog through crapivemade and I'm IN LOVE with these projects! Thanks for your blog!! SO excited to look through al of these fun projects! I also found your blog from crapivemade and LOVE this tutorial. I have thinking about what kind of trick or treat bag my little one would carry this year. Plus I have an excuse to eat ice cream! I came over from crapivemade and WOWZA! I have a TON of these buckets that I use for storage for the kids crayons, army men, blocks, etc. That is sooo cute. I love it. So creative! OH MY! What a great idea! My hubby just recently just bought a huge tub of ice cream last weekend and I got on to him for buying so much, but now I'm excited b/c I can try out this craft!! LOL Thanks for posting! Thanks for sharing such a sweet idea! What a cute idea! I love it! I'm always looking for cute ideas of things to make! You are so creative I love it! I just found you on U Create. What a neat idea. :) I'm adding you to my blogroll. Come check it out! I've actually got a few of these buckets! I didn't really want my husband to buy a big bucket of ice-cream, but now I'm glad he did! Hahaha! Thanks for idea! Love your blog! I just posted my version of the treat buckets on my blog! Thanks for the inspiration!!! Just found you and I am so glad I did! I found you via Char over at Crap I've Made. I love these buckets!! I decided to give it a try. Check it out and let me know what you think!! Super cute!!! I am going to have to share this great idea with some of my peeps!!! I love this bucket! I'm going to feature it if that's okay in a few weeks on my baby blog.